So . . . what did Duke do that warranted that kind of publicity? Duke, who turned 21 on Jan. 28, signed a three-year entry-level contract with the Vegas Golden Knights in what was the first player transaction in the NHL expansion franchise’s brief history. According to capfriendly.com, the deal could have a total value of US$2.775 million. It calls for an NHL salary of $742,500 in each of the first two seasons, and $825,000 in the third. The minor-league salary each season would be $70,000. There are annual signing bonuses of $92,500, and performance bonuses of $182,500 in each of the first two seasons and $100,000 in the third. “Obviously, there is going to be a little more opportunity there,” Duke told Perry Bergson of the Brandon Sun, “but, at the same time, I’m not going in there expecting them to hand me anything. I’m going to put in as much work as I can this summer to give it my best opportunity to play there (next) season. That’s going to be my goal. 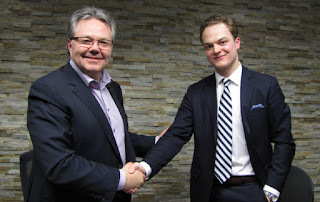 Kelly McCrimmon, the Wheat Kings’ owner, was the team’s general manager and head coach before joining the Golden Knights as their assistant general manager last summer. So he will be awfully familiar with Duke. This season, Duke, who is from Calgary, leads the Wheat Kings in goals (35) and points (67), all in 54 games. Last season, he totalled 61 points, 33 of them goals, in 68 games. In the playoffs, he helped Brandon to the WHL championship with 24 points, including eight goals, in 21 games. Duke began his WHL career with the Lethbridge Hurricanes, playing 132 games there before being deal to Brandon early in the 2014-15 season. In 306 career regular-season games, he has 249 points, including 113 goals. He was selected by the Minnesota Wild in the sixth round of the NHL’s 2014 draft. However, the Wild never signed him so he was able to join Vegas as a free agent. The Los Angeles Kings have signed two WHLers — D Kale Clague of the Brandon Wheat Kings and F Austin Wagner of the Regina Pats — to three-year entry-level deals. Clague, 18, is from Lloydminster, Alta. The Wheat Kings selected him sixth overall in the WHL’s 2013 bantam draft. Los Angeles took him in the second round, 51st overall, of the NHL’s 2016 draft. This season, Clague has 38 points, including 33 assists, in 46 games. He missed a few games to open the season after suffering a leg injury while playing for Los Angeles in a rookie game against the Arizona Coyotes. In 139 career regular-season games, he has 94 points, 15 of them goals. He spent part of this season with Canada’s national junior team, earning six assists in seven games at the World Junior Championship. According to capfriendly.com, the contract could be worth US$2.775 million. The NHL salaries would be $767,500, $792,500 and $817,500, with three signing bonuses of $92,500. There are performance bonuses of $157,500, $132,500 and $107,500. The minor-league salary would be $70,000. Wagner, one of the WHL’s fastest skaters, has 60 points, including 28 goals, in 58 games this season. In 232 regular-season games, he has 163 points, 77 of them goals. A 19-year-old from Calgary, he was a fifth-round selection in the WHL’s 2012 bantam draft. Los Angeles picked him in the fourth round, 99th overall, of the 2015 NHL draft. According to capfriendly.com, Wagner also signed a deal that could carry a total value of US$2.775 million. The NHL salary would be $742,500 for each of the first two seasons and $792,500 in the third. There are performance bonuses of $182,500 in each of the first two seasons and $132,500 in the third. Three annual signing bonuses of $92,500 will be paid. The minor league salary in each season would be $70,000. 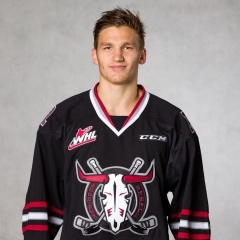 When the WHL’s weekly roster report is issued today (Tuesday), F Adam Musil of the Red Deer Rebels is expected to be shown as being out week-to-week. Musil, the Rebels’ 19-year-old captain, was injured Sunday in an off-ice incident. Sutter added that Musil has a “lower-body injury” and that there isn’t a timetable for his return. The Rebels, who have seven games remaining, are third in the Central Division, three points ahead of the Calgary Hitmen. The Rebels next are scheduled to play tonight against the visiting Saskatoon Blades, who trail Red Deer by four points in what could turn into a wild-card chase. Musil has career highs in goals (20), assists (31) and points (51) in 56 games this season. In 251 career games, he has 162 points, including 65 goals. “The timing is terrible,” Sutter said. “It’s unfortunate for his teammates . . . it’s unfortunate for the organization . . . it’s unfortunate for our fans that something like this has to happen when it should never have happened. “It was something we didn’t expect. It’s things we don’t want our kids doing and that’s the tough part. But it happened and now we just have to deal with it. Greg Meachem of reddeerrebels.com has more right here. The U of Alberta Golden Bears won another Canada West title on Sunday, beating the host Saskatchewan Huskies, 6-3, in Game 3 of the best-of-three-final. Both teams will play in the national championship tournament. That will be played in Fredericton, N.B., March 16-19. . . . The Golden Bears have won 14 Canada West titles over the past 17 seasons, although the Huskies won it all a year ago. . . . Darren Steinke was at Sunday’s game and blogs about it right here. The AJHL’s Fort McMurray Oil Barons have signed general manager/head coach Dan Keca to a three-year contract extension that runs through the 2019-20 season. Keca has been GM/head coach since June 2015. The Oil Barons who won 10 games last season, won the North Division with 91 points this season and Keca was named the AJHL’s coach of the year. Keca, who was raised in Fort McMurray, played for the Oil Barons before attending the U of Lethbridge. He returned to the Oil Barons as an assistant coach under Gord Thibodeau in 2003. Seth Appert is out as head coach of the Rensselaer Polytechnic Engineers, although his contract runs through 2021. RPI won only eight games this season. Appert was 152-221-48 in 11 seasons at RPI. . . . Collegehockeynews.com reports that Appert signed a seven-year extension in 2011 and got another three-year extension added to it in 2013. . . . Appert had been an assistant coach at Denver when he signed at RPI in 2006. RPI won 18 games in 2009-10 and 20 in 2010-11 when it made its only NCAA tournament appearance. This season, RPI finished 11th in the ECAC and was swept from the conference tournament, losing two games to Clarkson. Victoria at Kelowna, 7:05 p.m.
Kootenay at Medicine Hat, 7 p.m. Swift Current at Prince Albert, 7 p.m.
Saskatoon at Red Deer, 7 p.m.
Spokane vs. Seattle, at Kent, Wash, 7:05 p.m.